CLIPSO® Americas, Inc. is a registered Continuing Education Provider with the American Institute of Architects Continuing Education Systems. CLIPSO currently offers two different one hour AIA Lunch & Learn presentations. It’s as simple as scheduling a lunch hour with your colleagues at your facility; CLIPSO will do the rest. 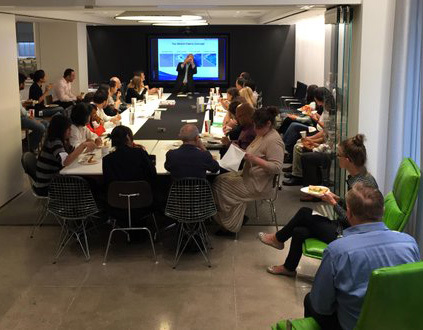 We provide lunch, beverages, an educational presentation on the newest and most innovative product category in the architectural and interior design field: Stretch Ceilings and Walls. Find out how this new category can greatly enhance your current and upcoming projects. Credits earned upon completion of these programs will be reported to CES Records of AIA members. Outline the health, safety and welfare concerns caused by ineffective acoustical planning in commercial and residential structures, and the subsequent negative impacts excessive noise and reverberation can have on health and wellness. Discuss how sound waves are either reflected, absorbed or transmitted through surfaces depending on the NRC values of surfaces within the space. Learn how alternative surfaces with with higher NRC values reduce reflected sound leading to improved acoustics within the space. Leave with a working knowledge of how stretch fabrics offer other health, safety and welfare benefits simultaneously (i.e. illumination) without having to introduce another product to accommodate a secondary need. Learn how Great Acoustics do not have to be compromised by Great Design. Great Design and Great Acoustics go hand-in-hand when when stretch fabrics are designed into a space. Develop a working knowledge of the Performance Ceiling & Wall Covering product category, often referred to as stretch ceiling & wall fabrics. Discover a variety of unique features & benefits associated with stretch ceiling & wall coverings. Describe the health concerns of noise pollution in residential and commercial structures, and understand how acoustic stretch ceiling & wall fabrics significantly minimize unwanted reverberation. Explore how custom shapes & designs can be easily achieved due to the versatility of stretch fabric systems. Understand how illuminated translucent fabrics can create a dramatic atmosphere, especially when combined with custom printed imagery. For more information, or to schedule a Lunch & Learn presentation, please contact our Inside Sales Manager, Frank Jones, at 646-422-0919 ext. 703, or fjones@clipso.com.